WDRL Belair Power Pro Mod Series. Presented by DY Concrete Pumps and Urlacher Motorsports. 07/21/18. Edmonton, Alberta. 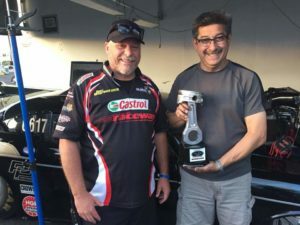 Edmonton’s Wade Sjostrom has taken a commanding lead in the WDRL Belair Power Pro Mod series with a Runner-up at Doorwarz VI in Mission B.C. and a big win at the MOPAR Rocky Mountain Nationals at Castrol Raceway in Edmonton Alberta. Sjostrom has been working hard on the Screw Blown Brad Anderson combination and the handling of his 1957 Chevy Belair Pro Mod to have a great start to the 5 race series based in Western Canada. Sjostrom went rounds at Doorwarz IV by taking out the very quick Paul Glandon with a 6.40/217mph in round one, then moved on to round two meeting Dal Sangha and getting him with a 6.54/224mph as Sangha is working on a new combination and never really got a solid run out of the car all weekend. The black 57 went on to outrun Steve Horn in his 41 Willy’s in round three with a 6.48 to Horne’s 6.60. To say that Sjostrom was consistent all day is an understatement. The final would present a formidable opponent in two time Champion Garrett Richards who also was having a consistent day with 5.91’s all three rounds. Although Sjostrom had a slightly better light, he didn’t have the power to get past Richards 5.89 240mph final run. Although the win went to Richards, Sjostrom had a great day and maybe a bit surprised to find himself in the final. MOPAR Rocky Mountain Nationals was weekend of ups and downs for the Pro Mod category. Low car count and a broken rear end on Rick Distefano’s Camaro lead to a six-car field for the Sunday finals. Sjostrom faced teammate and friend Ray Leyten in the first round and then moved onto face Paul Glandon in the Semi Final. Glandon having trouble as both drivers had to pedal their cars, Sjostrom made it to the Stripe first. The final was a battle of two 57 Chevy’s as Sjostrom met with newcomer Dean Bettenson whom had the number one qualifying spot and had a bye in the semi-final. A solid pass for both cars had Sjostrom getting the Stripe first and winning his first MOPAR Rocky Mountain Nationals Wally and WDRL Piston. 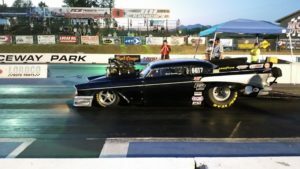 Wade now has the Points lead in WDRL Belair Power Pro Mod Pro Boost and overall Pro Mod category.